The lights go down in the arena. The crowd goes silent. The sound of bagpipes, badass drums and electric guitar fills the air. Drew McIntyre makes his way to the ring. The crowd roars, everyone is on their feet. Whether he is brought in by the NYPD Pipes & Drums band, like a recent action-packed NXT Live night in August, or by Gallantry, his official theme song, this 6’ 5” beast is ready to dominate anyone who gets in the ring with him. The scene is set for an incredible Saturday night of wrestling, something McIntyre, 32, has been doing for a cool 17 years. 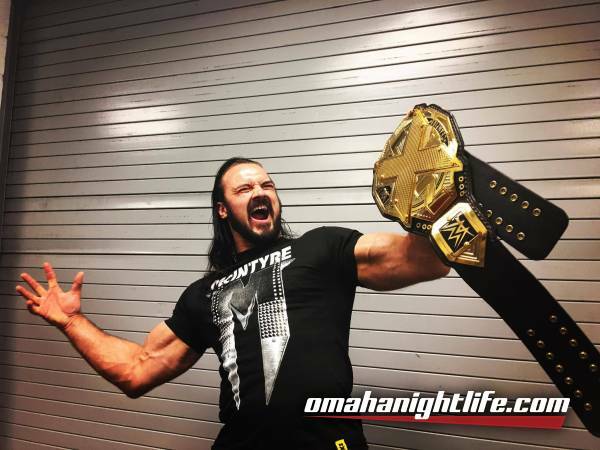 He announced his signing with NXT in April of this year and earned his first championship title with the franchise, but it’s been a long way to the top, starting as far back as he can remember. At 16, he and his friends pioneered what would become modern wrestling in the UK. Surrounded by supportive, but doubtful, friends and family, he became the first wrestler from Scotland to ever be signed in America. A lot has contributed to McIntyre’s success. When he was was in charge of his own schedule, he was the busiest wrestler in the world for two years straight. Last year, he stepped it up another notch and kicked his drinking habit. In the UK, drinking is a major part of the culture. He attributes the changes in his stamina and the way he looks and feels to this decision. He’s focusing only on the positives these days - owning his first home with his wife, eating better and most importantly, working hard to take over the world of wrestling. And he better hurry. “Wrestlers age in dog years,” McIntyre said. He’s done alright with those wrestling dog years so far. He has truly built a brand for himself from the ground up. Multiple national and international championship titles to show for his career and most importantly, always focusing on his fans first. Saturday will be no different. If you’re attending the October 28 NXT Live event at Ralston Arena, be prepared to have a voice because at these epic NXT showdowns, you aren’t just another face in the crowd in a sea of people. You should also be prepared to not have a voice by Sunday, these events get loud and rowdy. Stick around after the show. Following his matches, McIntyre takes pictures and signs autographs for his fans. Meet the man, the myth, the legend after Saturday nights show and see for yourself what a dedicated, passionate and determined Scottish wrestler looks like in the flesh.